Melasma is a common skin condition in which brown patches appear on the skin. 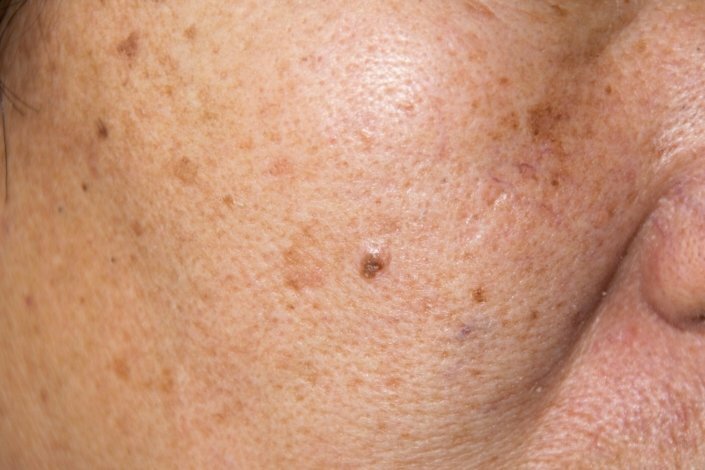 Melasma most often affects the skin on the face. It can also develop on the forearms and neck. Melasma is not a serious condition. But it can affect your appearance and the way you feel about it. Being out in the sun for too long and too often also puts you at risk for this condition. Melasma is common in people who live in tropical climates. People who have darker skin are also more likely to get it. Your doctor will be able to tell if you have melasma by looking at your skin. He or she may use a special lamp (called a Wood’s lamp) that uses ultraviolet light for a closer examination of your skin. In rare cases, your doctor may want to take a very small piece of your skin (biopsy) to make sure that the brown patches are melasma. Most people with melasma do not need treatment. Melasma may fade away slowly if you stop taking birth control pills or hormone replacement therapy. If melasma appeared while you were pregnant, it may go away a few months after you have the baby. If melasma doesn’t fade or it bothers you, it can be treated. Your doctor will probably prescribe a cream that contains hydroquinone. Creams that combine hydroquinone with kojic acid, azelaic acid, tretinoin, corticosteroids, or glycolic acid can also treat melasma. In some cases, your doctor may recommend a chemical peel, microdermabrasion, or laser treatment to help lighten the dark patches. Why did I develop melasma? Should I stop taking birth control pills or hormone replacement therapy? Will my melasma go away after I have my baby? Will the melasma ever go away? Should I change the makeup I use? Should I avoid going outside for long periods of time? What SPF sunscreen would you recommend? Change in skin color is the only symptom of melasma. The brown patches don’t hurt, itch, or physically affect you. The patches are usually an even brown color and are usually symmetrical. They tend to appear on the cheeks, forehead, nose, or upper lip. Can melasma be prevented or avoided? Since doctors don’t always know what causes melasma, it can be difficult to prevent it. The best way to avoid it is to use a broad spectrum, high SPF sunscreen every day. You should also wear a wide-brimmed hat to protect your face any time you’ll be out in the sun. It may take several months before you see the results of treatment. It’s important to follow your doctor’s recommendations, even if you haven’t seen any improvement yet. You may need to keep treating your skin even after your melasma goes away. This can help keep it from returning. It is also important to avoid being in the sun and to use sunscreen daily. This will also help prevent melasma from returning.